"Inseparable: Etanorm sweetens up my day, right from breakfast"
One of the largest sugar producer in the world, uses Etanorm as an important element in its production. The company processes sugar beet, while in other parts of the world sugar is extracted from sugar cane or starch with the help of the pump. Etanorm is used for this purpose because it ensures a high level of operating reliability. This is of extreme importance in sugar production. To operate economically, the pumps employed in this application must run particularly smoothly and offer the longest possible service life. Etanorm's operating reliability is achieved, among other things, through good NPSH values, confinement of the sealing element so it is protected, and larger thread sizes (from M10/M12 to M12/M16). In addition, a shaft protecting sleeve protects the shaft from wear, while the conical seal chamber prevents internal circulation and enhances ventilation and flushing. The confined casing gasket ensures reliability, even under varying operating conditions. Moreover, Etanorm scores points with its low wear and vibration levels and its excellent smooth running characteristics thanks to good suction performance and virtually cavitation-free operation across a wide operating range. But the pump offers even more than a high level of operating reliability. It is also very energy efficient, available in different variants and easy to maintain. That is why it is optimally suited not only for sugar production but also at home in many different applications: from beer brewing and air conditioning right up to water applications, wood and leather processing. Etanorm's optimised and experimentally verified hydraulic system with high efficiencies contributes to optimum energy efficiency: it saves up to 7000 kW/h of energy per year. With the KSB SuPremE® motor, efficiency level IE4* is achieved already today. In addition, the impeller is trimmed to match the duty point as standard. This is achieved by reducing the impeller's outside diameter to such a level that the pump's operating data exactly match the data specified by the customer. 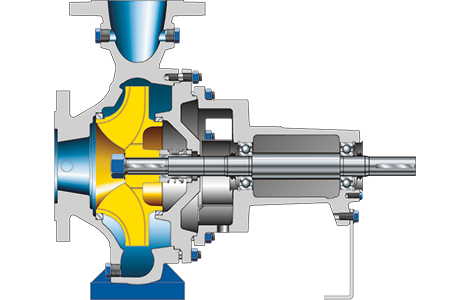 With its impeller so trimmed, the pump operates at the best efficiency point. This also contributes to the smooth running of the pump and prolongs its service life. Thanks to its wide range of variants, Etanorm is suitable for use in the most diverse of applications. The large quantity of materials available enables it to be optimally adapted to the fluid handled and, with its extended selection chart, additional sizes allowing for smaller flow rates are available as standard. Moreover, easy dismantling using forcing screws at the interface between casing cover and bearing bracket lantern makes the pump extremely easy to service. It is not by chance that Etanorm is the world's best-selling standardised water pump. 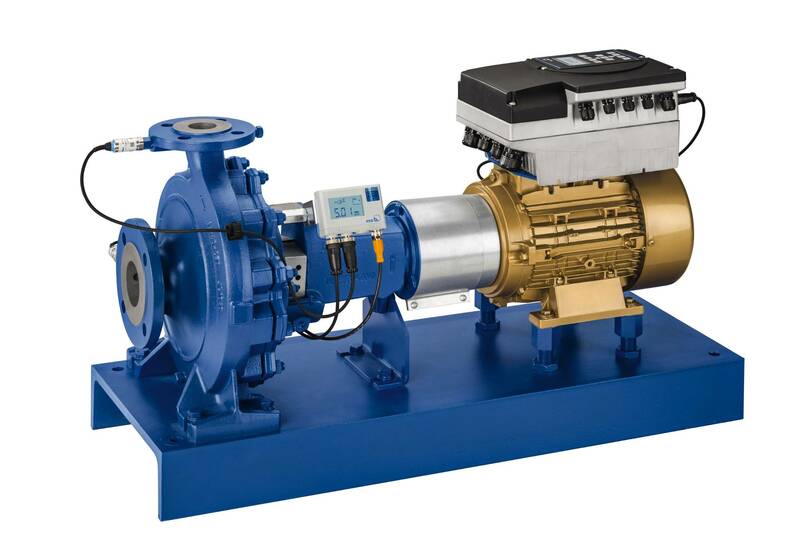 The combination of the PumpMeter monitoring unit and the PumpDrive variable speed system enables autonomously optimised operation with demand-driven operating modes and maximum savings. In accordance with Commission Regulation 547/2012/EC, Etanorm has an MEI ≥ 0.4. Should you have further questions or require more information about Etanorm, you can also easily contact us by completing the form on the right. Our specialists will get back to you promptly.